The Clark School aims to foster relationships with students as they progress through their undergraduate years and strengthen that connection long after they've graduated, keeping the culture of "paying it forward" alive and well. 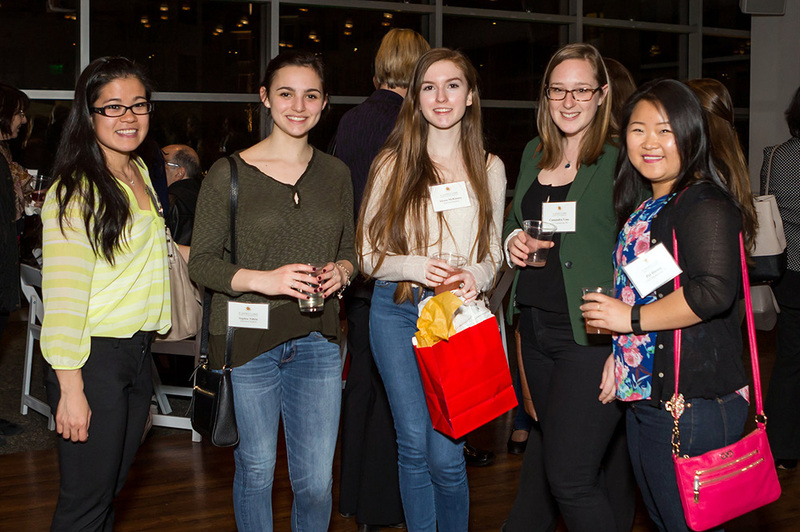 Inspired and initiated by alumnae, an admitted students reception was held March 29, 2017, to provide young women in high school an opportunity to network with the fearless women who paved the way for them in the male-dominated profession of engineering. At the VisArts center in Rockville, Md., more than 40 alumnae gathered to welcome recently admitted students into the University of Maryland. Dean Darryll Pines welcomed everyone and introduced the Clark School. Food in hand, and flanked by a parent or guest, students mixed and mingled at an event that was organized specifically with them in mind. To encourage students to strike up conversations with the alumnae, who had been in their shoes not too long ago, students were provided with a question guide. "Can you tell me one of your best experiences at Maryland? Could you picture yourself where you are today when you were a student? How did you pick your major?" were some examples of ways students could break the ice and engage with the alumnae. Jenni Carter (B.S. '81, chemical engineering), an alumna who attended the reception, enjoyed speaking with the young women and discussing how engineering can be used as a foundation to pursue work passion later in life. "Engineers learn problem solving that can be used in any field," she said. One can easily transfer that kind of skill to another discipline, Carter explained, but it would be difficult to do it the other way around. The event aimed to demonstrate to the admitted students that at Maryland, you have a supportive community eager to help you succeed. The wide spectrum of alumnae presented themselves as examples to the students. Becky Kenemuth, assistant director of outreach and recruitment for the Women in Engineering program, explains that for the alumnae, the event served as a personal touch point. "They have been in their shoes, they paved the way and built connections – look at where they are now," Kenemuth said. "These admitted students see alumnae as role models who inspire and mentor them as they work to achieve their professional goals." The mission that many Clark School alumnae subscribe to is the gesture of paying it forward. The reception was planned to show that there are people who are dedicated to advancing women in engineering – and that starts with admitted students.